Since they started canning at their second brewery site, Mornington Peninsula hasn't been shy in bringing new beers to market. Their #tinnage limited release range has popped out a new (or previously only available on tap) beer every month or two. Yet they've not made as much fanfare about any of those beers – even those that became Australia's first nitro cans – as they are with Hop Culture, a beer that comes with a striking design bolder even than any of those #tinnage beers. They clearly have big plans for the session IPA too as the Pop Art-inspired World War II fighter pilot yelling "Gadzooks!" 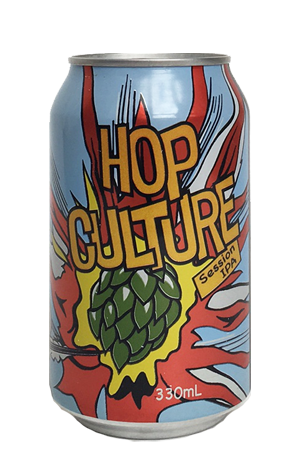 as he tears towards an exploding hop cone is printed on the can, rather than a label stuck onto the can, meaning they've invested in plenty of them. They've also spent a fair amount of time honing the recipe to get it where they wanted it: sub 5 percent ABV and full of hops. It's a beer that delivers on the tropical hop front, both in terms of aroma and flavour, and does so without leaving much of a mark in terms of bitterness at all. As a result, it drinks rather too easily, slipping down like smooth hop juice and plugging the gap between the brewery's less hopped up Pale and more aggressively bitter IPA rather nicely indeed.